Using theoretical frameworks to explore the political, organizational, and cultural dynamics of performance budgeting, this book examines the adoption of performance budgeting in a variety of countries, how it has been implemented, and why it succeeded or failed. Chapters include case studies from a wide range of continents and regions including the US, Africa, Asia, Australia, Europe, Latin America, and the Middle East. 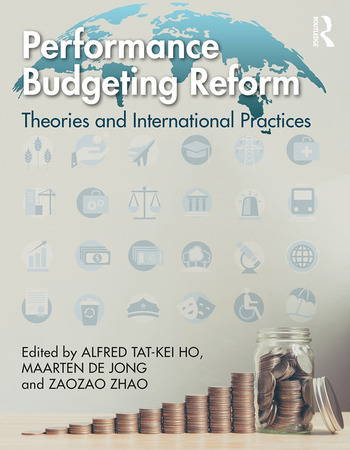 Each case study pays careful attention to the unique historical, political, and cultural contexts of reform and closely examines how performance informed the budgetary process. Chapters investigate theory-drive analysis, focusing on common themes related to international policy diffusion, organizational change, stakeholder politics and gaming, communication and information management, principal–agent dynamics, and institutional constraints. Contributors include both scholars and seasoned practitioners with extensive experience in implementing or advising performance budgeting reforms. With emphases on both theories and practices, this book is written for graduate courses in public budgeting and comparative public administration, providing theoretical insights into budgeting reforms in developing countries, as well as practice-relevant and actionable recommendations for current and future policymakers and budget reformers. Alfred Tat- Kei Ho is a professor of public administration at the School of Public Affairs and Administration, University of Kansas in Lawrence, Kansas. His research focuses primarily on budgeting and fi nancial management, performance management and governance, and e-government. He has produced many journal articles, book chapters, and peer- reviewed conference proceedings in these areas, as well as numerous research reports for local governments, foundations, and international organizations, including the Asian Development Bank, the Alfred P. Sloan Foundation, the National Science Foundation (US), the IBM Center for the Business of Government, the William T. Kemper Foundation, and U.S. local governments in the states of Arkansas, Indiana, Iowa, and Missouri. Maarten De Jong is a research affi liate and guest lecturer of the Het Zijstra Center for Public Control, Governance, and Leadership at Vrije Universiteit (VU) Amsterdam. Since 2018, he has also been a public sector performance expert at the Dutch Court of Audit, and was a senior budget specialist of the Dutch Ministry of Finance in 2007–2018. In addition, Dr. De Jong is a researcher, consultant, and lecturer of various international organizations, including the International Monetary Fund, the World Bank, the Organization for Economic Cooperation and Development (OECD), and the European Commission, and has provided technical assistance to 12 countries. He holds Masters in both Business Administration and Public Sector Control and earned his Ph.D. in Public Administration at Erasmus University, Rotterdam. His research focuses on the impact of budget reform, budget institutions, and the use of performance information by public agencies. His publications have appeared in both professional and academic journals, such as the OECD Journal on Budgeting and Public Administration Review . Zaozao Zhao is an associate researcher of the National Academy of Economic Strategy (NAES) under the Chinese Academy of Social Sciences (CASS). Her research focuses on public budgeting and financial management, performance budgeting, auditing, and inflation. She was the principal investigator or a core researcher in several major projects funded by the National Natural Science Foundation of China, the Chinese Ministry of Finance, the Chinese Academy of Social Sciences, and the National Development and Reform Commission of the Chinese government. Dr. Zhao has published over 30 articles in several core management and economic journals in both Chinese and English, including Auditing Research, Subnational Fiscal Research, Journal of Asian Public Policy, and Journal of Chinese Governance. She also co-authored a book, titled Public Budgeting: A Comparative Study, which was collected into the National Achievement Library of Philosophy and Social Sciences in 2010 by the Chinese government.